TORONTO, ON – (September 30) – Canadian Music Week is pleased to announce J. Robert Wood as the 2016 inductee to the Canadian Broadcast Industry Hall of Fame. 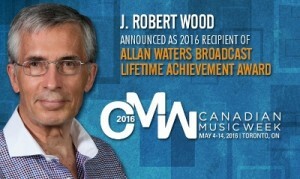 An innovator and veteran of the industry for more than five decades, Wood will be honoured for his achievements and longstanding career in broadcasting with the Allan Waters Broadcast Lifetime Achievement Award. The induction ceremony will take place during the Canadian Radio Music Awards luncheon beingpresented by Bell Media, on Friday, May 6, 2016 at the Sheraton Centre Toronto Hotel. I am sure you have seen these types of studies before that ask the hypothetical question…. if a product were to disappear would you miss it? In the last few weeks the folks at Mark Kassof & Co. conducted some research along these same lines asking questions about radio. According to the Kassof study of 1,289 Americans, Radio isn’t going anywhere any time soon, and almost 50% of respondents said they would miss FM a lot, 29 % somewhat and 18% a little. Just 7% said they wouldn’t miss FM at all, while 1% did not have an opinion. In terms of demographics, listeners age 45-54 would miss FM the most (55 % said a lot), while just 31 % of 18-24s said they would miss it a lot. AM Radio did not do so well as 51% of younger people said they would not miss AM radio at all if it went away. If fact only 11% said they would miss AM radio a lot, while 17% said they’d miss it somewhat, 18% said they would miss a little and 2% didn’t know. I suspect if this same study was conducted in Canada the number of people who would miss AM Radio would be greater especially in the “flat” provinces where AM signals are huge, and in some markets the AM’s generate as much revenue if not more than the FM’s. However there is still lots of love among listeners who prefer the news/talk format with 32% saying they would miss AM a lot, 38 % somewhat and just 19 % wouldn’t miss it at all. Radio is still very popular and there are lots of studies in both the USA and Canada that indicate 93% of the population or more listen to radio each and every week. Think about that for a moment… how many brands or companies would love to have that many people consume their products or services each and every week. I continue to be puzzled by those want to knock the medium for not having a greater share. Radio has a greater weekly share than television, it blows away newspaper and makes billboards, and magazines look rather pathetic. Motor vehicle manufactures know from the research they have conducted that consumers expect the radio on the dashboard. This was talked about a great deal at last year’s DASH conference in Detroit and I am sure it will be hashed about again at this year’s DASH event which happens in 3-4 November. Bell’s CIQM was static at 11.4 but that was enough to get them to the top slot in Vancouver as the CBC took a bit of a drop and slipped back to #2. CKNW grew audience slightly to retain their #3 position. CFMI-FM (Rock 101) continues its climb and, while audience share is about static, it is up another place to 4th. Bell’s Virgin Radio (CKBT-FM) moves up one slot to 5th but is flat at a 6.8% audience share. However, it is well short of the 7.9 share it had when the station was branded as The Beat. Other stations on the move include Jack FM (CJAX-FM) up 2 slots to 6th .as well as their sister station News 1130 (CKXW) who is up slightly and jumped 3 places to #7. Newcap’s Z95.3 (CKZZ-FM) took a big hit and appears to have shed all the audience they picked up in the last measurement period and drooped 4 places to 8th. 93.7 JRfm (CJJR-FM) and CFOX make it into the top 10 in Vancouver but both saw audience declines. CHFI has retaken the #1 spot in Toronto again, just edging out CHUM-FM. While weekly and daily cume’s look to be healthy, the overall shares for many stations continue to decline which is either a PPM wobble (low sample sizes) or may indicate a drop in time spent listening. CBC makes it into 3rd spot but loses some share even though they were aggressively marketing via television over the past few months. Newcap’s Boom 97.3 (CHBM) increased share slightly and is now tied for 3rd spot in the market. Virgin radio also increased share but holds steady in 6th place. Q107 is also up slightly and jumps two slots to #7. The Corus sister station CFNY increased by more than a point. Overall, there were 10 stations who enjoyed audience increase (based on 12+ % share) and 8 stations who were either static or lost audience. MZ Media (CFMZ-FM) lost more audience and slipped from 6th to 10th Toronto. 680 news also lost some audience and dropped a slot to 8th. CFRB also lost a full share but holds onto the 5th spot in the market. 680 news (CFTR) were static in 8th, but it will be interesting to see how the talk and news stations do in the next measurement period with a Federal Election in October. Bell continues its stranglehold and actually increased its audience share of the Montreal Anglo ratings to retain the top spot again. They are now more than 10 points ahead of the #2 station. Cogeco’s 9-2-5 The Beat (CKBE-FM) stays at #2 but lost more audience, as the gap between them and Bell’s Virgin Radio 96 (CJFM-FM) gets even closer and Virgin holds onto the #3 spot. The Classic Rocker CHOM-FM stayed in its normal 4th spot and rounding out the 5th spot is the CBC so no changes to positing in the top 5 this time around. The Bell owned TSN Station CKGM took a big hit in the book and looks to have lost over 28,000 listeners based on daily cume. 102.3 NOW! (CKNO-FM) is still #1 but slipped a little in audience share. The CBC (CBX) holds onto the #2 slot even though they have lost more audience share. CISN-FM picks up audience but holds steady at 5th. Newcap’s 96.3 Capital FM (CKRA-FM) is flat at an 8.4 but will be happy that they are now tied for 3rd in the market. Some shuffling of the Rock stations this time around sees Newcap’s K-Rock (CIRK-FM) pick up 2 slots to 6th while The Bear (CFBR-FM) drop from 7th to 10th place. The Corus “Fresh” brand looks to be gaining some traction in Edmonton as CKNG-FM moves from 11th to 8th in the market. The Rogers Modern Rocker, Sonic (CHDI-FM), also looks to be on the move and went from 12th to 10th in this crowded rock market. Country 95 (CKRY-FM) retains in the top spot in Cow Town, but Newcap’s XL 103 FM (CFXL-FM) had another strong book, increasing audience share to hold onto the #2 slot. This is the first time this station has made it to double digits. The Rogers News station (CHQR) @ 770 on the AM dial increased its audience by almost a point and is a strong #3. The CBC picked up some of the audience losses from the last measurement period but is static at #4. Q107, the Corus Classic Rocker (CFGQ-FM) lost some audience but picked up a spot to #5. Bell’s Virgin Radio (CIBK) lost all the gains from last time and slipped back a spot to 6th. Newcap’s AMP Radio (CKPM-FM) increased audience share slightly and picked up 2 slots to #7. 660 News (CFFR) is up in share and makes it into 8th place. Rawlco may be wondering about the wisdom of blowing up their “Adult Hits” format as the “Up Brand” went from 13th to 9th. As of September they are now playing AC and branded as Soft Rock 97.7. It will be interesting to see how it performs in the next book. The other big rocker in Calgary (CJAY), which is now owned by Bell, squeaks into the 10th slot with a slight audience share increase. The Rogers station, KISS (CHFM-FM), which is now branded as playing “Today’s Best Music,” continues to shed audience while across the hall, Jack FM (CJAQ-FM) was flat.